KYIV, Ukraine—Citing Russian cyberattacks as a national security threat, Ukrainian President Petro Poroshenko signed a decree on Tuesday banning several popular Russian social media sites, as well as other Russian websites and news outlets, for three years. The move was part of a comprehensive cyber sanctions package against Moscow, which included a ban on VKontakte, or VK, a popular Russian-language social media site in Ukraine that is, in effect, an Eastern European version of Facebook. “I urge all compatriots to immediately get out of Russian servers for reasons of security,” Poroshenko wrote in a farewell statement on his own VK page on Tuesday. “Massive cyberattacks of the Russian Federation around the world, in particular, the recent intervention in the election campaign in France, indicate that it is time to act differently and more strongly,” Poroshenko wrote. He urged his followers to follow him on other social media sites like Twitter, Facebook, and Instagram. Ukraine is VK’s second-largest market after Russia. About 12 million Ukrainians use VK each month, representing roughly 29 percent of Ukraine’s overall population of 42 million. Also included in the ban is the Russian-language social media site Odnoklassniki—which has 5 million monthly users in Ukraine—Russia’s top search engine, Yandex, and the Mail.ru email service. 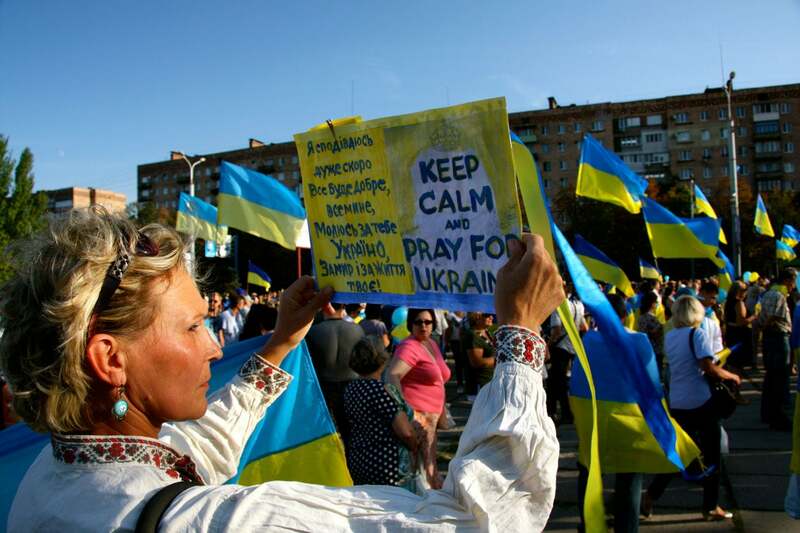 Many Ukrainians opposed the sanctions. The Ukrainian sanctions name 468 Russian companies and their subsidiaries in Ukraine, as well as 1,228 individuals. Several Russian TV channels and websites were banned, including NTV, the news agency RIA Novosti, and RT, or Russia Today—a Kremlin-funded news outlet that has a presence in the United States and in countries across Europe. “I do not think that this is a good idea,” Alexandr Kulikov, a 24-year-old lawyer who lives in Kyiv told The Daily Signal. 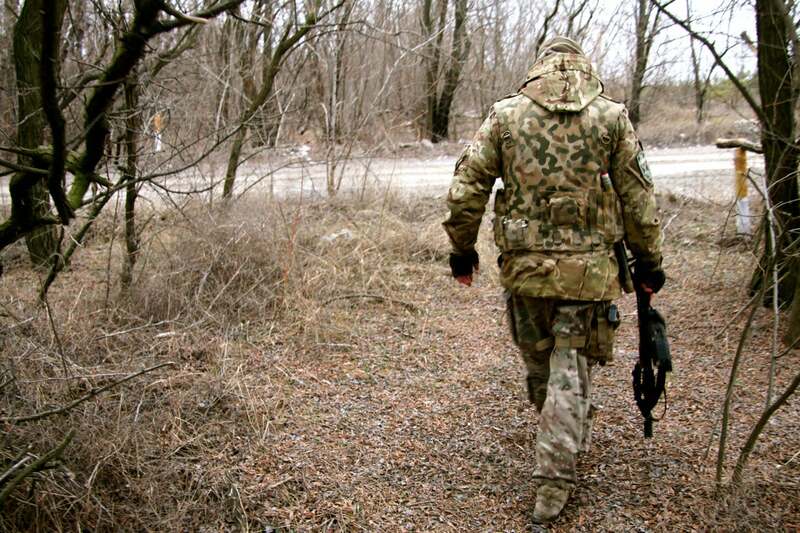 Despite a February 2015 cease-fire, the war in Ukraine has not ended. The decree follows through on a April 28 recommendation from Ukraine’s National Security and Defense Council. The measures are anticipated to go into effect no later than June 1. On Tuesday, Dmitry Peskov, press secretary for the president of Russia, called the Ukrainian sanctions “another manifestation of unfriendly, shortsighted policy toward Russia,” according to the Russian news agency TASS. “There are not so many major information resources in Ukraine, which are popular in the Russian-language space,” Peskov said. For many Ukrainians, particularly millennials, VK has become an indispensable part of life. Its instant message is a popular means of communication. It’s where many people find their music, organize social events, and advertise their businesses. University students use the group chat on instant messenger to coordinate study sessions and discuss homework assignments. 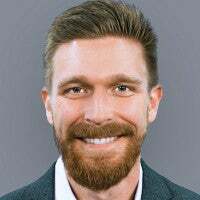 “Blocking social networks is a Poroshenko trick,” Yevhen Semekhin, a 30-year-old public relations director at a Ukrainian construction company, told The Daily Signal. Some experts, however, praised the move, saying it was long overdue. “If it will be possible to do this, this will be the greatest contribution to the protection of information sovereignty of Ukraine ever,” said Yevhen Fedchenko, director of Ukraine’s Mohyla School of Journalism and the founder of StopFake, a news site dedicated to debunking Russian propaganda, according to Ukrainian news reports. The war in Ukraine has lasted for more than three years, claiming the lives of about 10,000 Ukrainians. “I stopped using Russian services in 2010 after 300 letters disappeared from my mail at mail.ru,” Lyubov Velichko, a journalist living in Kyiv, told The Daily Signal. Other Ukrainians took the middle ground. They said the country needs to bolster its cyberdefenses, but doubt whether the ban announced on Tuesday will be effective. “In general, this initiative is correct from the point of view of national security, but unfortunately, the blocking will not stop Ukrainian users from using Russian sites and resources … there are so many ways to bypass the lock,” Mykhailo Vasyanovich, a 29-year-old executive secretary for the Ministry of Information Policy of Ukraine, told The Daily Signal. Vasyanovich heads a Ukrainian information technology company, SmartGT, which develops webpages for civic and charitable organizations, and civil society groups. He said government officials need to clearly explain to the Ukrainian people why the ban is essential to national security. “In the conditions of a hybrid war, it is possible to prohibit the use of these resources by the military, civil servants, state institutions, but with other users of the internet network, it is necessary to explain how the collected information can be used against them,” Vasyanovich said. The combined use of propaganda and cyberwarfare to support military operations on the ground is a hallmark of Russian “hybrid warfare”—a modern interpretation of a Soviet military doctrine called “deep battle,” in which military operations extend beyond the front lines deep into an enemy country’s territory in order to hinder its ability to wage war. In Ukraine, Russian military forces have combined kinetic military operations with cyberattacks and sophisticated propaganda campaigns geared toward TV and internet audiences. 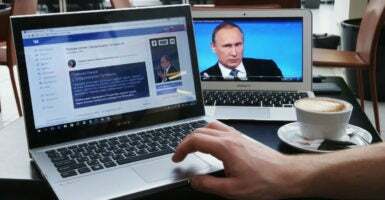 Russia used propaganda and cyberattacks to lay the groundwork for its 2014 invasion of Ukraine’s Crimean Peninsula and subsequent proxy war in the Donbas, Ukraine’s embattled southeastern territory on the Russian border. In an earlier statement emailed exclusively to The Daily Signal, Poroshenko described the scope and impact of Russian propaganda and cyberattacks on Ukraine. 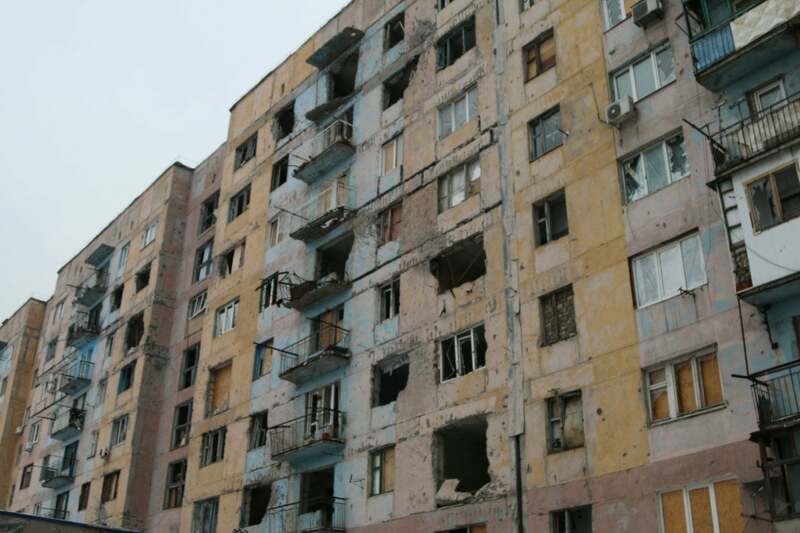 Artillery damage in the front-line town of Avdiivka. Ukrainian forces have been at war with a combined force of pro-Russian separatists and Russian regulars in eastern Ukraine since April 2014. The conflict has, so far, killed 10,000 Ukrainians and displaced 1.7 million people. 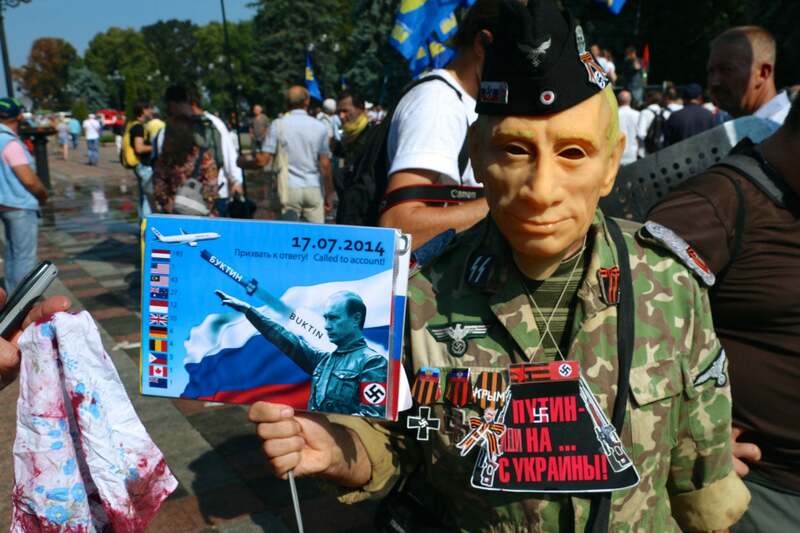 The Kremlin denies it is involved in the Ukrainian conflict. On Saturday, four civilians—three women and one man—died in the front-line town of Avdiivka during an artillery strike. “Russia’s aggression against Ukraine has shaken the very foundations of security and stability in Europe, and is antithetical to a vision of Europe that is whole, free, and at peace,” Kate M. Byrnes, chargé d’affaires for the U.S. Mission to the Organization for Security and Cooperation in Europe, said on May 11 to the OSCE Permanent Council in Vienna.